- We may not be as fast as some other companies, but we believe that taking that extra little time, spend an extra few days or weeks on YOUR painting, will show you the difference! - We want to make sure we have Happy Customers that want to return for years to come. - We want you, our customers, to be happy with the final results at all times. - We want you to Never have to Settle for Less! - We put our love, devotion and attention to every brush stroke and every detail with every painting. By commissioning a painting through Timeless Art On Canvas ( www.timelessartoncanvas.com) or purchasing any of our existing Original Art, you are hereby agreeing to the terms and conditions outlined in this agreement. If you are purchasing an already existing and available painting from one of our galleries all payments will have to be made upfront before shipping. Just like with commissioned art, Payment(s) can be made using PAYPAL, by sending a check, or money order in advance. If sending a check, payment will have to clear our bank, before any work can be started. That can take up to 7 business days. Shipping and Handling, as well as any applicable Texas Sales Tax will apply. If in the Greater Houston Area we can arrange for drop off or pick up if so desired and requested. No Shipping Charge will be charged for personal pick up or delivery. Once you receive your painting, it is not returnable and you will not receive a refund of payment unless otherwise agreed upon. Without limitation, Timeless Art On Canvas holds the full and complete copyright and reproduction right to copy, exhibit, publish, display, or distribute copies of all paintings. The customer will not use the image of the painting except for individual use without written permission from Timeless Art On Canvas. 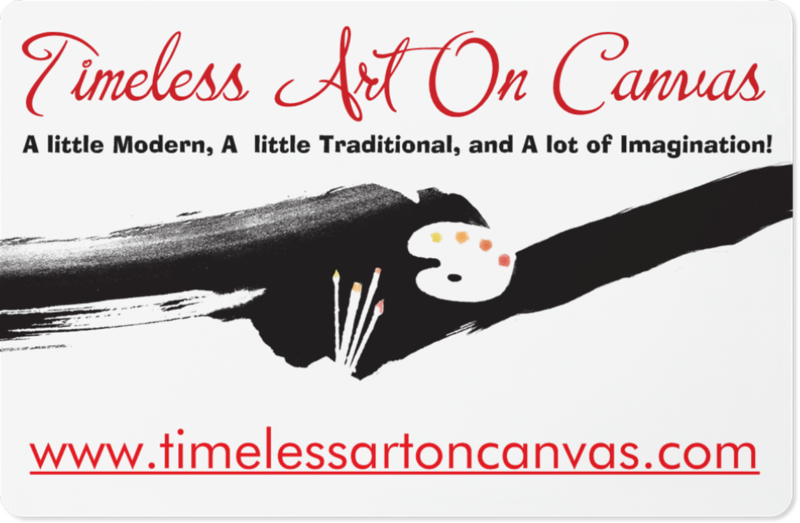 Please send Timeless Art On Canvas a detailed e-mail to timelessartoncanvas@gmail.com about your needs and desires. A Deposit to start work by Timeless Art On Canvas is required to cover cost which is 50% up front. This is non-refundable! Balance due at time of completion. Payment(s) can be made using PAYPAL, by sending a check or money order. The commissioned painting will be the subject of a painting produced by Timeless Art on Canvas, and the painting will be the artist’s interpretation of the subject based on the pictures and information provided by the customer. If sending a check, payment will have to clear our bank, before any work can be started. That can take up to 7 business days. Shipping and Handling, as well as any applicable Sales Tax will apply. The customer will supply the photo(s) of the pet(s), subject(s) and/or detailed desired information about the painting in mind that will be used for the painting along with as much detail as possible about what they want their portrait or painting(s) to look like. It is the responsibility of the customer to supply any photographs or other materials that will be used as references for the portrait or painting. These reference materials can be sent to the artist by uploading as attachments in an email. The artist(s) and customer will communicate about the painting, such as suggesting changes, variations in color, background, desired details before the first brush stroke is made. Once agreed and approved by customer, the artist will then complete the painting of your animal (s), loved ones or other. When the commissioned painting is completed, the artist will send a digital proof of the final painting for the customer’s approval. Once the customer’s final approval is received, final payment for the completed painting is due. Once final payment has been received, the painting will be packaged, insured and shipped. Tracking No. will be provided after it shipped to the customer at once. The customer also gives to Timeless Art On Canvas, for free, an unlimited license to use customer’s supplied copies of photos for promotional purposes, and any other purpose deemed needed for Timeless Art On Canvas. Customers will then be able to make print on demand framed prints, puzzles, aprons and other keepsakes of their commissioned Timeless Art On Canvas painting. If a customer requests a change to the portrait or painting, after the customer has already approved the artist to advance, there will be additional charges. These types of changes could include layout, size, canvas, theme, style, material, design and major color changes. In most cases these charges will be no less than $65.00 and no more than $140.00 depending on the extent of the changes. If at any time during the first phase of The Portrait Process, you decide, for any reason, that you want to cancel your order or you do not wish to purchase the artwork after completion and digital proof, the 50% deposit will be kept by the artist. This is non-refundable! The art then becomes property of the artist and can be used in any fashion without permission. Once you receive your finished painting, it is not returnable and you will not receive a refund of payment. The time line for the completion of a portrait or any painting can vary depending on several factors, such as the size of the canvas and number of subjects in the portrait, whether a custom background is required, how many special details are requested by the customer, time spent waiting for approvals, etc. Because of these factors, the artist cannot be held to any specific time line. If however, there are no delays on the customer’s end, most paintings should be finished and ready for shipping within the United States can vary between 21-35 days of receiving all customer supplied reference materials, digital proof approval etc. as discussed above. Larger orders and additional subject can add 7 + days. International Orders will obviously take longer due to shipping time. Not seeing the options or answers you need? We pride ourselves and uphold high standards in everything we do. Always 100% Hand painted with Love, Devotion and Attention to Detail, from abstracts, to custom pet portraits.